The condition of dyspnea on exertion may occur due to various factors. However, the most common cause is reduction in body oxygenation. People suffering from dyspnea on exertion mostly suffer from this symptom. Chest breathing and mouth breathing are two of the other main causes that could lead to exertional dyspnea; these conditions can reduce oxygenation in body and brain and create a sensation of shortness of breath or air hunger. Studies have shown that people who suffer from heart diseases, diabetes, cancer, cystic fibrosis, COPD, asthma and other chronic ailments are prone to this debilitating symptom. What can we infer from the differences in their body oxygenation and breathing while at rest? Why is it so that people with chronic ailments are prone to exertional dyspnea than healthy people? What are the main problems that one may suffer from when the oxygen transport system gets sick? Evidences indicate that advanced stages of asthma lead to destruction of lungs, a mismatch in ventilation-perfusion and arterial hypercapnia that would further deteriorate oxygen levels in your body. 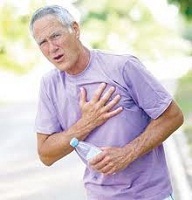 Chronic hyperventilation or an involuntary deep-breathing phenomenon leads to hypocapnia in lungs (shortage of CO2), which in turn results in lower levels of oxygen in body cells. Hence, such people suffer from problems during physical exertion; these people need more oxygen while exercising, this leads to dyspnea on exertion. Physical exertion can cause the worsening of gas exchange and further over-breathing resulting in additional CO2 losses in lungs. Anaerobic cell respiration while at rest and an increased level of blood lactate at rest are the main causes for this phenomenon. This leads to a state of acute dyspnea on exertion, faster and heavier breathing are noticeable, as hunger for air gets more prominent. Respiratory receptors in brain sensing low oxygenation create a sensation of air hunger and eventually increase ventilation. Normal or healthy breathing is very slow and small. This pattern is unperceivable as about 4-6 liters of air ventilation takes place in a minute, whereas patients suffering from dyspnea experience minute volume (minute ventilation) of a whopping 12 liters per minute at rest and have a breathing frequency of over 18 breaths/ minute. 3. Occurrence of sputum and chronic inflammation in respiratory tracts leading to further obstruction or narrowing of the air movement. Clinical trials have shown that application of various respiratory devices and breathing techniques have brought gradual changes in basal breathing patterns while at rest, increase oxygen levels in body and reduce the intensity of hyperventilation. In general, patients with exertional dyspnea need to achieve over 20 s for their body-oxygen tests so that they can prevent dyspnea on exertion and at rest.